I've been working through some of the exercises from the Keys to Drawing on my ipad. This exercise is Project 1F – Mechanical Objects. He suggests drawing a sewing machine, egg beater or an old rotary pencil sharpener. 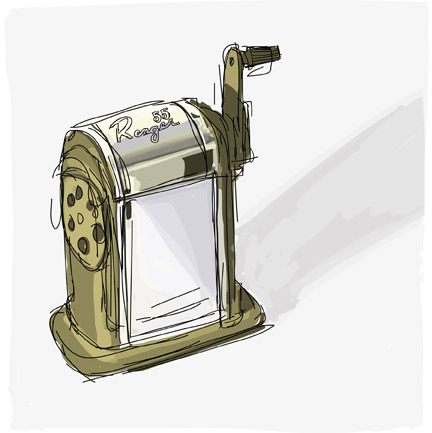 I drew a vintage Boston 55 pencil sharpener, which is solid metal and will last a lifetime. The X-Acto Ranger 55 , which is the current version, is solid black instead of chrome and beige. The reflections were the fun part of this drawing and I like the sketchiness of the line work, especially around the crank.